Below you’ll find our recommended Madrid hotels according to star category. The majority of first time visitors to Madrid will stay somewhere near Puerta del Sol and Gran Via so most of our chosen hotels are in this central tourist area. The 5 star options tend to be in more upmarket areas outside this tourist centre but with easy access by public transport. If you’re coming to watch Real Madrid there are a few option near the Bernabeu but you’re far better off staying in the centre and taking transport or walking to the stadium (45 minutes). Business travellers might be interested in our recommended airport hotels. This completely renewed hotel is located in the historical centre of old Madrid. An ideal base from which to discover the city. A perfect location, right on Puerta del Sol with easy access to all the city’s attractions. Our favourite for location and value. A fine budget option located just off the Gran Via in the city centre. Popular with our city break visitors. An excellent choice located just a few paces away from Puerta del Sol but with the advantage of being located in a peaceful square. Staff are very helpful. Combines the elegance and comfort of a classical hotel together with the newest amenities of a four star hotel in the heart of Madrid. If you’re going to watch Real Madrid, perhaps you’d prefer to stay near the Bernabeu. This is the choice hotel of FC Barcelona when they play in the capital. 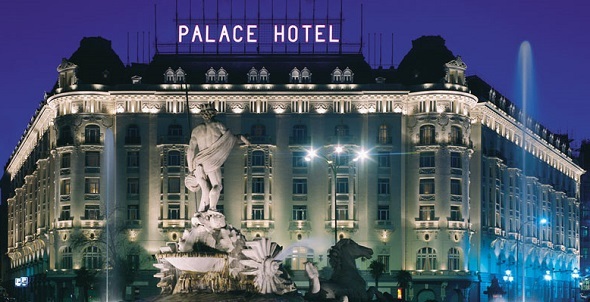 In the heart of Madrid, the Westin Palace is a monument to elegance. In 2002 it was named added to the prestigious Condé Nast Traveler’s Gold List. One of Madrid’s finest hotels. Old-world charm combined with modern elegance help make the Villa Magna one of Europe’s finest hotels. It is situated just outside the tourist centre in the wealthy Salamanca district. Inclusion in the prestigious ‘small luxury hotels of the world’ list, the Villa Real is another excellent choice located in the heart of the city between Puerta del Sol and the Prado. The classical Ritz hotel is a landmark of Madrid. It lies next to the Prado museum and offers everything you could expect, and more, from a hotel of this calibre. Highly recommended hotel located slightly to the north of the main tourist area on the Paseo de la Castellana. For a comprehensive list of properties in Madrid take a look at what’s available at Booking.com. Tired of staying in hotel rooms? Then why not rent an apartment in Madrid and do away with the need to eat out all the time. These days there are many properties on offer, many in historic city buildings.